Guadalest A very interesting day out in Guadalest a Valencian town located in a mountainous area of Alicante, Spain. Superb area for hikers. 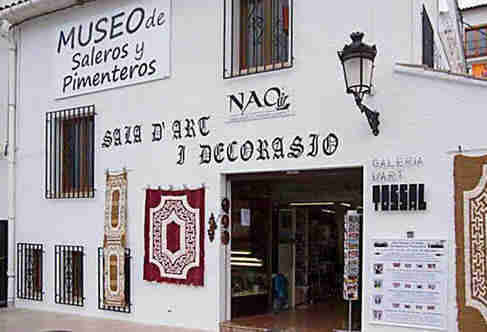 Once you arrive in Guadalest there is a host of things to do, our first visit of the day was to the Salt and Pepper Musem, just one of the many places of interest in Guadalest. 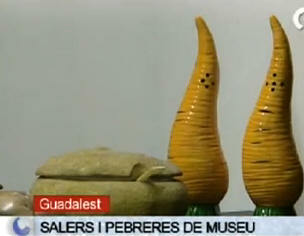 The new attraction in El Castell de Guadalest is the Museum of salt and pepper shakers. 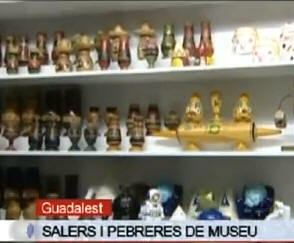 The collection consists of over 20,000 salt and pepper shakers worldwide. Winter timetable: from 11:00 to 18:00 h. Monday to Sunday. We were all given an in-depth lecture about the World of salt, salt and pepper shakers, and salt cellars from Andrea Ludden and her son Alex. And very interesting it was. As we wandered around the museum I found it hard to believe that the twenty-thousand pair display of fat chefs; ruby red tomatoes; guardsmen in bear skins; The Beatles; Santa’s feet sticking out of a chimney, pistols and potatoes; a copy of the salt and pepper shaker cufflinks that Lady Diana wore (which fortunately, are sealed or their contents would have sprayed everywhere when she shook hands), have any other reason for coming together than simply being someone’s idea of being collectable – but they do. “Salt is much more important in our lives and history than most people think,” says Alex. “The word ‘Salarium’, salary, comes from the fact that Roman soldiers were paid part of their income in salt. It’s also thought that the word ‘soldier’ itself comes from the Latin sal dare, to give salt. If you look at common phrases such as ‘the salt of the earth’, he’s not worth his salt’, etc you can get an idea of how important salt was.” And it still is, because without salt in our diet we couldn’t survive. The collection of over forty thousand pairs, half in Guadalest and half in their museum in Gatlinburg, Tennessee, started by the simple purchase of a pepper mill at a garage sale, shortly after the family moved to the US – but it didn’t work! 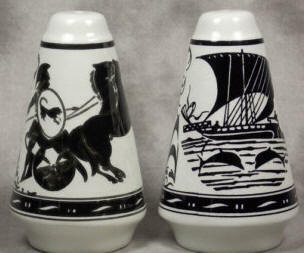 The vogue for collecting salt and pepper shakers was mainly brought about by the invention of the automobile. It was because people could travel more freely, either for work or on holiday that the souvenir industry came about. But the world of salt and pepper shakes and cellars knows no boundaries: from the Cellini Saliera, cast in solid gold (and sometimes referred to as the ‘Mona Lisa of Sculpture’), insured for $60million, to the prosaic plastic red pepper, a steal at only 75 centimos at the local bargain shop, there’s something for everyone.